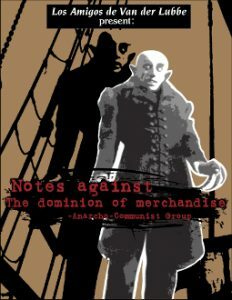 To follow the last post, here is the newly finished english version of a comic/zine (originally done in spanish by the comrades at https://graficasdeagitacion.blogspot.mx) which takes the majority of its source text from “The Dominion of Merchandise”, but adds a good portion of extra content and some great detourned graphics. An article from 2013 issued by the now defunct “Grupo Anarco Comunista” of Mexico. Note: To cite the comrades of “Cuadernas de Negacion”, and this is so that the diverse quotations which we cite remain clear… “As in all cases in which we publish citations, texts, pamphlets, or fragments, the said inclusion doesn’t absolutely imply an uncritical acceptance of them, without caring about to whom these words belong to, the militants who wrote them or the organizations of which they formed a part of”. That which interests us is always incorporating the critique inside of the grade of involvement in the class war, relate with others and potentate our class as a negation… and for this reason we hope to provide quotations which clarify that which some call “annoying” and which is nothing more than a moment of the class war, a moment of unitary critique, a moment of class consciousness and with it: subversive praxis. For us, unitary critique/class consciousness is identical to subversive praxis. Welcome Comrades! The purpose of this blog is to provide translations and information by and for the anti-capitalist and anti-authoritarian community. Unless otherwise noted, all translations posted here are original and copyleft!, so feel free to distribute them as you like – and do please get in contact if you have questions or come across any errors. Neither rojigualdas nor esteladas. For class independence against every nation!